Anyone tried to put a R&P in an H-body. Need more clearance where the drag link is for a deeper pan..
what motor and pan are you using? sbc 350 and the Moroso Vega/Monza pan #20230..
That pan is only deeper in the rear sump area. The factory V8 motor mounts tend to sag over time reducing the oil pan to drag link clearance. You may need to replace or shim the motor mounts. Power by Ace and V8Monza.com both offer replacement mounts of improved design for factory V8 cars. To answer your original question, people have converted H-bodies to rack and pinion but it is costly just to gain oil pan clearance. next question -what mounts and headers/manifolds are you using? I have a motor plate, and Stahl kit headers (1 7/8"). I wanted to build a 3.750 stroker engine, but need a deeper pan on the front half, I only have 1/4" clearanceon the Moroso pan now. Overkill Racecars made some tubular K members with rack mounts. He stopped doing H body parts for a while but he might make more. Thanks Smiley, wish I knew about this place 5 years ago..
Waybad reposted some of his rack pictures that were wiped out by photobucket. had wild steering issues, made for very scary higher speeds. so it does make for an exciting ride! LOL. Okey dokey so how much benefit do you get installing a R & P? Is the steering more precise? I have been thinking about it for a while now because I can't stand the really vague steering in my Monza. It drives like a boat. If you use aftermarket rods with the 3.75" crank the oil pan you have should work. You can get your steering box rebuilt with the fast ratio internals. 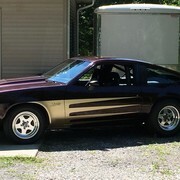 I put a Vega manual box in my Monza, steers real good, only 1 1/2 turns stop to stop (25" tires)..